First run in 1891, the 1200-kilometer Paris-Brest-Paris, or "PBP" as it is commonly called, is a grueling test of human endurance and cycling ability. 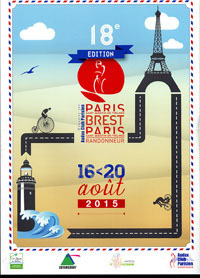 Organized every four years by the host Audax Club Parisien, the Paris-Brest-Paris Randonneurs is the oldest bicycling event still run on a regular basis on the open road. Beginning on the southern side of the French capital, it travels west 600 kilometers to the port city of Brest on the Atlantic Ocean and returns along the same route. Today's randonneur cyclists, while no longer riding the primitive machines used a hundred years ago over dirt roads or cobblestones, still have to face up to rough weather, endless hills, and pedaling around the clock. A 90-hour time limit ensures that only the hardiest randonneurs earn the prestigious PBP finisher's medal and have their name entered into the event's "Great Book" along with every other finisher going back to the very first PBP. To become a PBP ancien (or ancienne for the ladies) is to join a very elite group of cyclists who have successfully endured this mighty challenge. 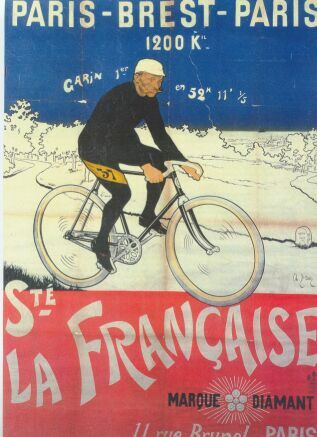 No longer a contest for professional racing cyclists (whose entry is now forbidden), PBP evolved into a timed randonnée or brevet for hard-riding amateurs during the middle part of the 20th century. The event is held in August every four years. To learn more, please explore the links below. If you are new to randonneuring, please check out the FAQ pages for additional information.